Digital camera photo recovery software utility recovers and retrieves deleted, erased and lost pictures, snaps, photos, audio, video files and folders from digital camera storage media. Picture recovery tool is capable of restoring data when memory card is being pulled out from digital camera when still running in on mode. 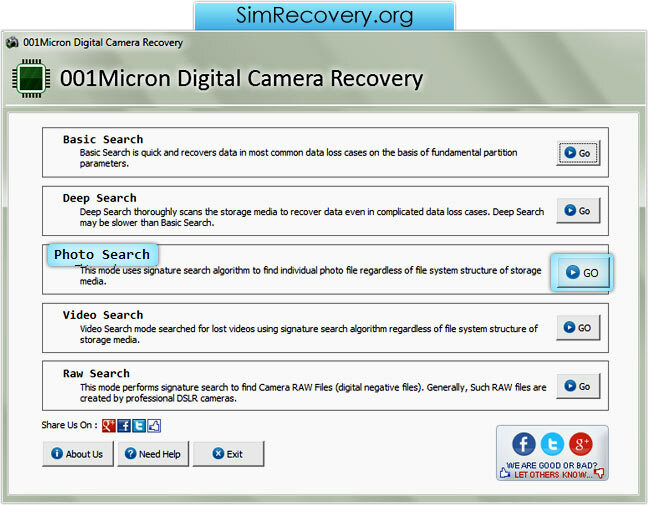 Digital camera files recovery software retrieves logically damaged data from formatted storage media, hardware malfunctioning, disk crash error, software corruption, inaccessible files and folders of digital storage media with support to all major files formats including jpg, avi, flv, pdf, jpeg, bmp, gif, tiff, ppt, mp3, png etc. Utility provides simple and user-friendly graphical user interface to help users to operate the software easily. Supported Brands of Digital Camera - Acer, Aiptek, Data Pack, Nikon, Kingston, Digital Dream, Chinon, Compaq, Ericsson, Everex, Hitachi, Imation, Strata Flash, Canon, Fuji Film, Casio, Kodak, Olympus, Sony, Panasonic, Samsung, Imation, Sanyo, Konica-Minolta, Mitsubishi, Kyocera, Lexica, Phillips, Toshiba, SanDisk, Pentax, Yashica etc. Types of Cameras - Digital video cameras, Specialty cameras, Professional cameras, Prosumer cameras, Novelty Cameras, Point and Shoot cameras in different storage sizes and pixels. Save Option - Log files can be saved to specified location in storage media for future reference. Supported Files Formats including - BMP, PCX, GIF, PNG, JPEG, TIFF, MOV, RIFF, TIF, JPG, AVI, MIDI, MPEG and all RAW picture file formats. Recovers files - Even if memory card being pulled out from camera while camera still in on mode.